Daskara...High-end, flavorful olive oil from Palestine, unveiled June 19, 2012 at the Summer Fancy Food Show held in Washington D.C. Daskara, an ancient Arabic word means both "village" & "handmade." "Palaestina Prima" refers to the name for this region during the Byzantine era of the late antiquity & signifies that this excellent quality extra virgin olive oil represents Palestine's best! Daskara Extra Virgin Olive Oil is grown, milled & bottled in Palestine, one of the earliest centers of olive tree cultivation. Daskara olive oil boasts a robust, distinctly fruity flavor, displaying both green & ripe olive fruit characteristics, as well as aromatic notes of tomato, grass, green apples, almonds, & toasted nuts. Daskara olive oil...bold, yet balanced. 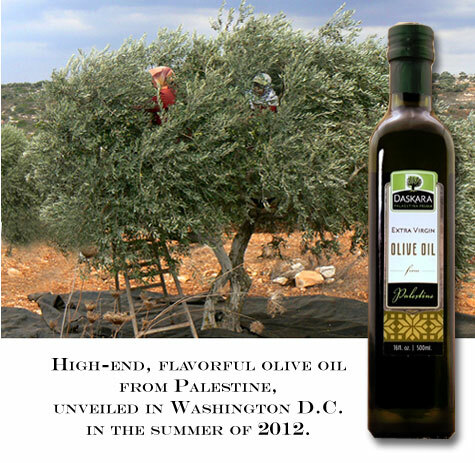 Daskara olive oil is produced from the Nabali olive...historically the most prevalent variety grown in Palestine. It is a challenge to produce excellent quality extra virgin olive oil in this region where land ownership is disputed & limited water is available for irrigation. Daskara oil is subjected to chemical & organoleptic assessments to ensure that Daskara meets or exceeds the standards for extra virgin olive oil established by the International Olive Oil Council & Palestinian Standards Institution. Third-party certification of its extra virgin quality sets Daskara apart from other oils produced in this region. Every bottle of Daskara proudly bears the PSI Quality Mark. Please enjoy this newcomer to the U.S. market. Daskara is best appreciated mixed with fresh herbs & spices as a dipping oil, as a finishing oil drizzled over seafood, chicken, heirloom tomatoes, or pasta dishes. Enjoy! Daskara Palaestina Prima Extra Virgin Olive Oil.